Next month's debut of Avengers: Endgame will surely change everything we know about the Marvel Cinematic Universe to-date, and begin a brand new era for the on-screen Avengers franchise. There will probably be a couple of painful goodbyes to be said by the fans, as well as the characters in front of the cameras, leading to plenty of tears to be shed in the movie theaters. However, even if Captain America or Iron Man perish in the fight against Thanos, the MCU will continue on into the future, and it looks like the storied franchise has already planted the seeds for a new central trio that will lead the way in a post-Endgame world. The original "trinity" for the MCU consisted of Steve Rogers, Tony Stark, and Thor. Yes, there were other characters in the first Avengers movie, but these three were the ones who's solo films anchored the MCU early on, and who paved the way for the rest of the franchise. 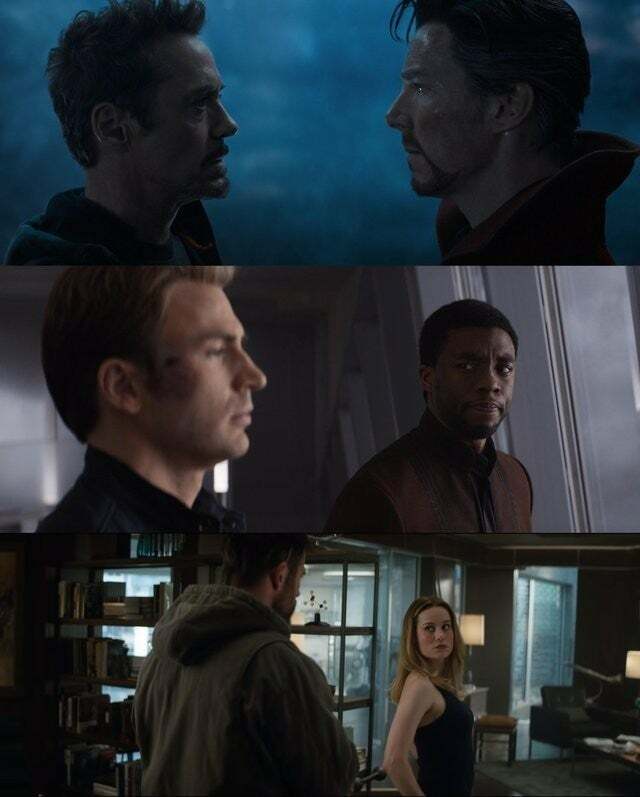 When they move on, which two of them seem sure to do in Endgame, the torch will need to be passed. Luckily, Kevin Feige and the folks at Marvel have already started passing those torches to a new wave of heroes, each with very similar traits to their predecessors. As pointed out by Reddit user Brunolt, Marvel has seemingly set its new Trinity with Doctor Strange, Black Panther, and Captain Marvel. Each of them fills the shoes of one of the previous trio, with all three of them getting significant time with their predecessor, helping to set up the passing of said torch. Check out the image below. Each of the original members of the Trinity is seen in a specific shot with the next generation. Tony Stark is staring down Doctor Strange, Steve Rogers is laying out a strategy with T'Challa, and Thor is testing Carol Danvers. When you think about all of these six characters, it makes sense why Marvel chose who they did to take over. Like Tony Stark, Stephen Strange is an incredibly intelligent and arrogant man who had to overcome personal tragedy in order to become the hero those around him needed him to be. Like Steve Rogers, T'Challa is a stoic leader with a strict moral compass and a passion to protect others. Thor and Captain Marvel each come from distant worlds (for the most part) and bring immense amounts of power to the table, as well as a quirky sense of humor. Yes, there are young characters like Spider-Man, Shuri, and perhaps even Kate Bishop who could represent a wave of young and exciting heroes in future MCU adventures, but they won't be leading the charge. At this point, it looks as if the franchise now belongs to the likes of Doctor Strange, Black Panther, and Captain Marvel, which is more than enough reason to be excited for the next chapter of Marvel's big screen story. Avengers: Endgame is set to hit theaters on April 26th.